With a little help from Honors graduation you will be looking extravagant on your important day. This graduation marks the end of one journey and the start of your next, it is important to look the best that you can. Graduation is a time that students who have successfully reached this point should be honored, that is part of why we have these ceremonies. Students who have dedicated years of their life to making it to this point have earned this celebration. As you are surrounded by family and loved ones be sure to take some time to reminisce on all the positive memories and lasting friendships that you built along the way. Even though I am sure you have had your fair share of great moments, you did not make it here without some hardships here and there. Learn from each of your experiences as you make the jump into your next adventure whatever it may be. Our graduation tassels in light blue and gold are a high-class way to go. The light baby blue complemented by the gold is a classic look that will be excellent for representing yourself among your peers. 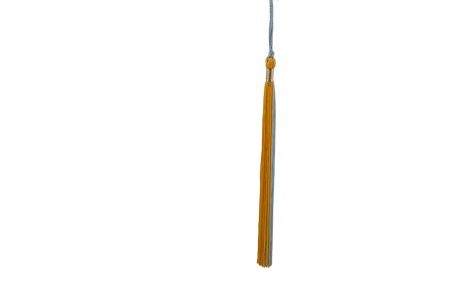 Graduation Tassels are typically worn on each student's graduation cap and are moved from the left to the right upon receiving a diploma or other degree. Many students choose to represent their school by wearing a tassel of their school colors while honor students wear unique tassels to symbolize their success. Whether you graduated with honors or not, your graduation tassels make for the perfect keepsake after graduation. Many graduates like to hang their tassels on the mirror in their car, thanks to the durability of the tassels this is one piece of memorabilia that will last for years to come. We also have an outstanding customer service team that is always ready to help here at Honors Graduation, check us out today! Not what you're looking for? Check out our Complete List of Graduation Tassel Colors.